Watch the Great American Gold Rush on video. 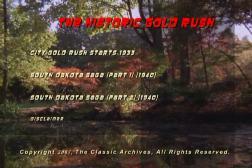 Includes South Dakota Saga and City Gold Rush Starts. Vintage Footage. Gold has been associated with the extremities of utmost evil and great sanctity throughout history. In the Book of Exodus, the Golden Calf is a symbol of idolatry and rebellion against God. In Communist propaganda, the golden pocket watch and its fastening golden chain were the characteristic accessories of the class enemy, the bourgeois and the industrial tycoons. Credit card companies associate their product with wealth by naming and coloring their top-of-the-range cards “gold;” although, in an attempt to out-do each other, platinum (and the even-more-elite black card) has now overtaken gold. Brief newsreel story from the early 30s about gold being struck on a farm outside of Cincinnati. This, as you can imagine, causes a local epidemic of gold fever, which is reported breezily by the narrator. A slice of life from the desperate days of the Depression. Gold mining and the life of gold miners in South Dakota, as seen by the mining company. Goes through the gold mining process from the mine. An educational look at the process.